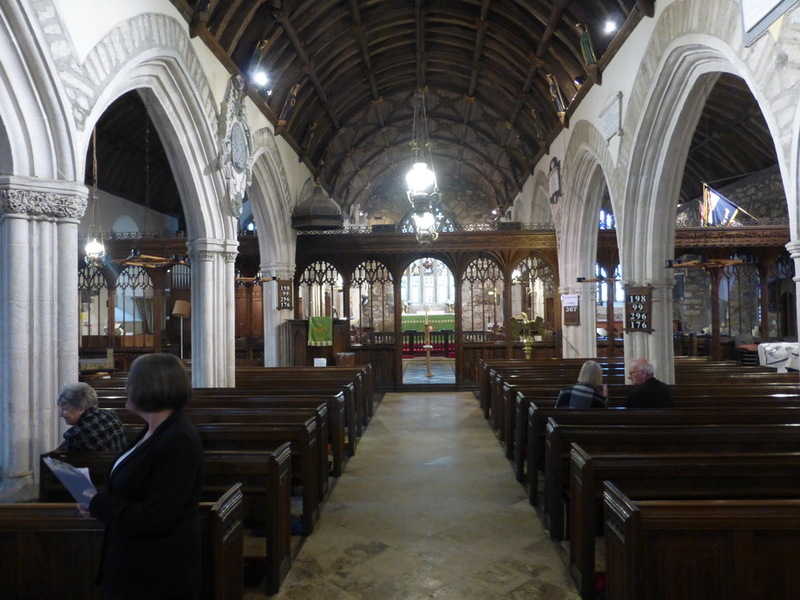 We have eventually managed to visit St Maddern’s church which had previously been in our amber Hall of Shame. Warning of a impending funeral meant that we could make a very hurried visit to this church before the service started. Simon Jenkins awards one star to the church for its atmosphere and Nelson memorabilia, a marginally mean scoring as there is much to see. 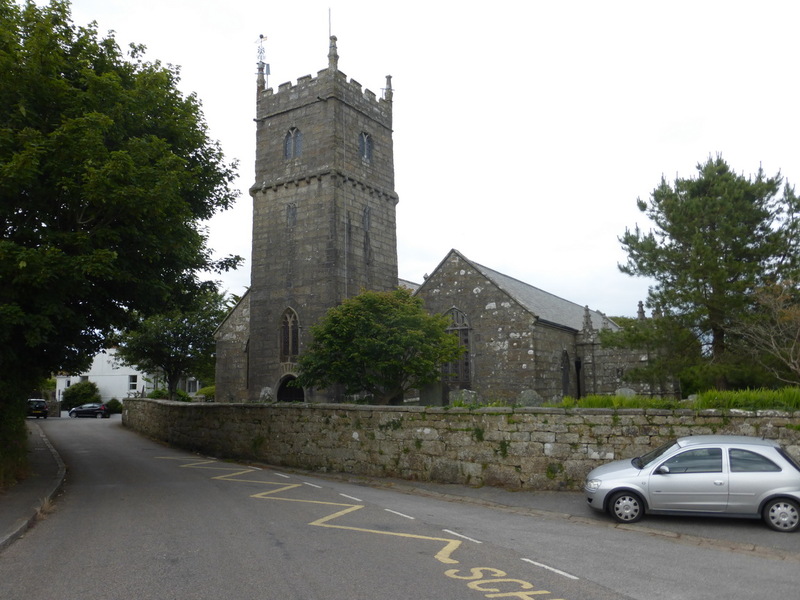 Madron was the mother church of Penzance. Situated in a village 100m above sea level, it was situated safely back from the coast where marauders might be hovering. Half a mile away is the holy well of St Maddern, one of the most well-known in Cornwall, with its little baptistery and plethora of votive offerings. The church has three co-terminus aisles and two porches – a very fancy C19 one and a much simpler north one – and a tall two-stage C14 tower. 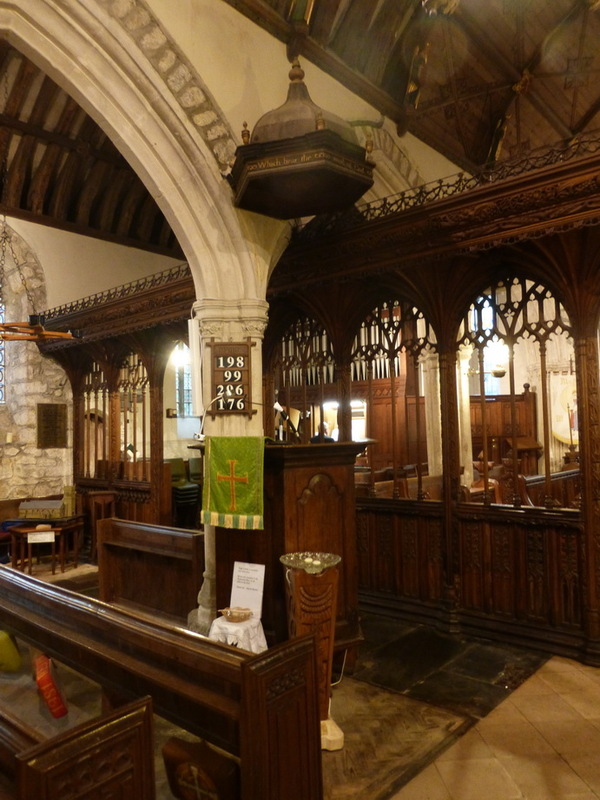 Its restoration was by JD Sedding between 1886-9 and it is one of his better ones, the new rood screen being light enough not to offend the long sweep of the wagon roof. There are some original elements in this screen. There are monuments aplenty. 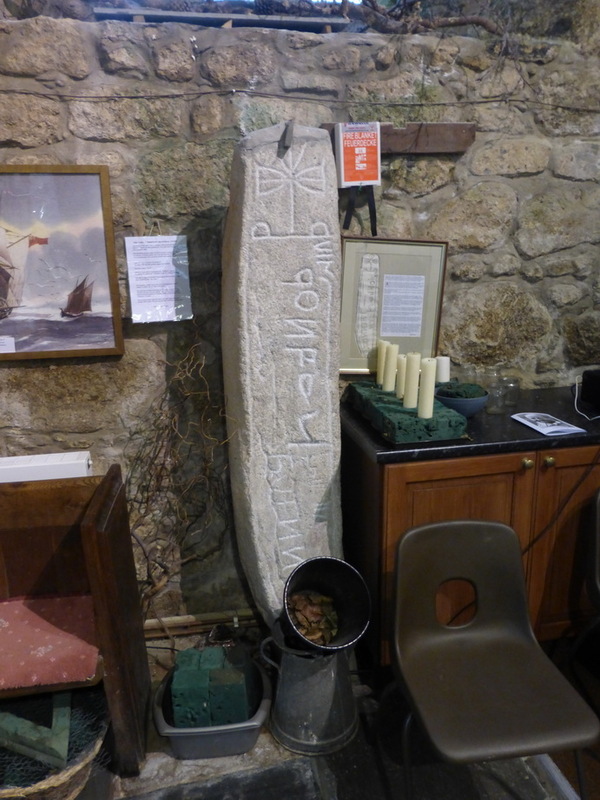 Those to John Maddern (d1621) and to Thomas Fleming and family (d1631) are in slate while John Clies (d1623), a former mayor of Penzance gets one in brass. A C7 or C8 inscribed stone remembers someone called Qonfal, son of Vennorcit. This is treated with the usual respect of such things, with boxes, chairs and flower-arranging materials stacked around it. The most dominant memorial is to Lord Nelson. 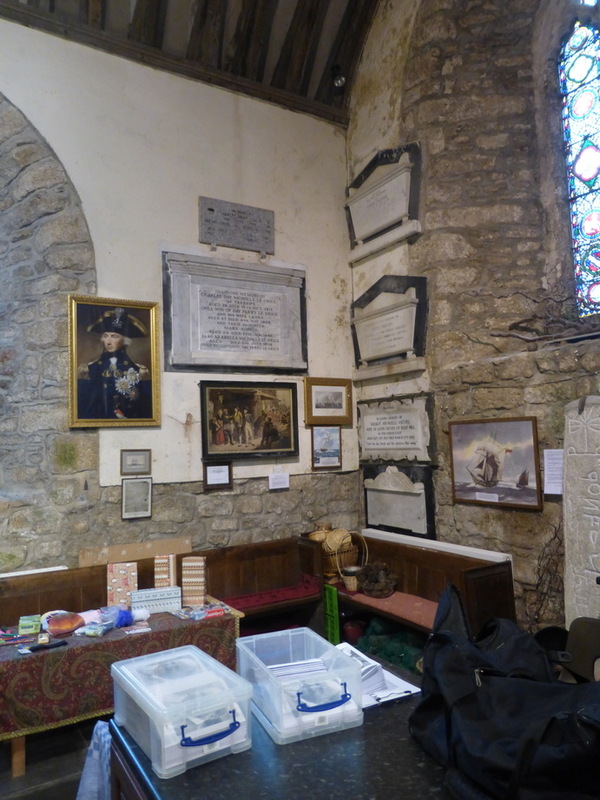 An entire corner of the church is dedicated to memorabilia of Trafalgar: pictures, facsimiles and the great ‘Nelson’ banner which was said to have been carried in the first procession mourning the hero’s death. Tradition has it that the news of the great battle first came ashore at Penzance. After the battle HMS Pickle was despatched by Lord Collingwood with the happy/sad news. Its commander, Lt Laponetiere, landed in secret at Falmouth on 4 November 1805 and headed off for London. It is said that HMS Pickle met a fishing vessel in Mount’s Bay, told them the news and which thus reached Penzance before London. A service was then held in Madron church. The trouble is that there is no solid evidence for this as Laponetiere was determined to keep the news secret until he reached London. Some writers have suggested that the news that came ashore at Penzance was of an action by Sir Richard Strachan which took place on 4 November. Having captured four French ships, Sir Richard brought these through Mount’s Bay on the 9th. Perhaps it is churlish to cavil as this is unquestionably Madron’s moment of national historical glory. In the churchyard are two significant crosses. One is a Gothic cross-head, while the other has a figure with arms outstretched. Charmingly, the figures has holes down its tummy rather like a gingerbread man. There are also some massive monuments to local worthies. The church is well worth a visit but time things carefully. In the absence of a funeral you have a meagre two hours a day: Fridays and Saturdays 10-12 all year round and Tues-Thurs 2-4 July-September. Unless you can find the vicarage and beg for the key.